The Rundown: Siblings Angus and Julia Stone are from Sydney, Australia. Joining forces in 2006, Angus and Julia have released two albums, “A Book Like This” (2007) and “Down the Way” (2010) and six EPs a compliation, and a bonus CD, “Chocolates and Cigarettes” (2006), “Heart Full of Wine” (2007), “The Beast” (207), “Hollywod” (2008), “Live Sessions (iTunes Exclusive)” (2009), “And the Boys” (2009), “Big Jet Plane” (2010), and “iTunes Live: Live from Sydney” (2010). The sibling duo has enjoyed enormous success in Australia finding high spots on the Australian Music Charts. 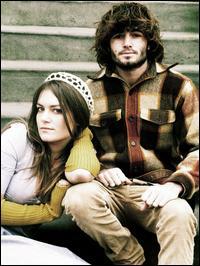 Angus and Julia Stone’s debut album, “A Book Like This” peaked at #6 on the charts while their follow-up album, “Down the Way” peaked at #1 and went triple platinum. Prior to forming the dynamic Angus and Julia Stone, both Angus and Julia performed their own solo material while using the other as a backing partner. Angus and Julia’s music has been used by many American TV shows over the years including Grey’s Anatomy, Life Unexpected, Lipstick Jungle, Skins, 90210, and One Tree Hill among many more. The acoustic duo has also won a bevy of award nominations and have also won awards which include Song of the Year (2011), Songwriter of the Year (2011), Album of the Year (2010), Single of the Year (2010), and Best Music Video (2008). While acoustic guitar is the main instrument for this band, they are also known to use harmonicas, trumpets, cellos, pianos, mandolins and drums. Julia Stone has a beautiful voice which, at times, faintly reminds me of singers such as Mette Lindberg and Miss Li. Her voice is soft and sweet. When combined in excellent vocal harmony with her brother, the songs become entrancing. Angus and Julia’s music could be classified in many different ways depending on who is singing and who created the song, as their sound spans numerous genres such as Blues, Jazz, and Folk. Their songs are simple, yet, in that simplicity the listener is treated to an amazing combination of intelligent music, intensely deep lyrics, and sophisticated sounds. MarsBands.com is proud to share this amazing band with you, and hope that you’ll share them with your friends.